PNN is the first Trendspotting AI® machine powered by AIHPC® cloud to help asset managers optimize portfolios for investment success. 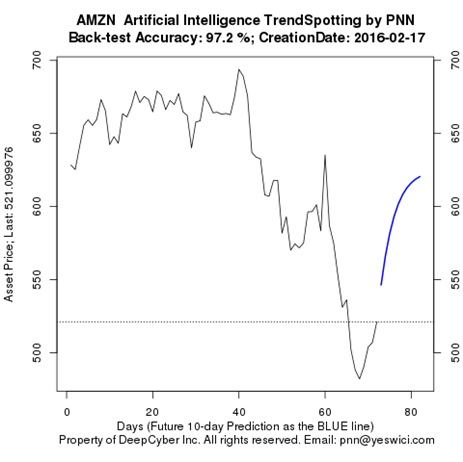 Predictive Neural Nets (PNN) - Predict long-term trends of assets (equity, ETF, mutual funds, cryptocurrency) by Trendspotting AI® for investment success. -- Since its inception (2010 in Maryland USA), our team has been developing the intellectual property of PNN AI (methods, systems and the patent) in stealth mode. Recent adoption requests from institutional asset managers and investors indicate the significant financial values of the PNN ecosystem. Mission - PNN offers FinTech AI-BigData-Cloud (ABC) innovations to answer "Is the Market Rigged?" and "How to Outperform Warren?" Differentiation - 1) FinTech ABC innovation to extend Shiller and Fama 2013 Nobel work on trendspotting in asset markets; 2) rigorous investment process with AI and human intelligence; 3) cross validation by relevant assets; 4) Web and mobile interface - easy to use anytime anywhere; 5) PNN apps ecosystem; 6) Automated big data collection, machine learning models building, models selection on accuracy, visualization, and cross validation; 7) Superb back-test and forward-test accuracy. How to pick assets and price M&A assets? 1) PNN charts visualize asset trendspotting outcome with AI algorithms to help asset managers optimize investment allocations; 2) PNN charts use AI to accurately price assets to design successful merger and acquisitions. Powered by AIHPC® cloud (see AIHPC book), PNN is an ABC (AI-BigData-Cloud) innovation to automatically train, optimize and validate machine learning models to predict trends of individual asset prices. How to optimize share buyback programs (BBP) for CEOs? The PNN solution helps CEOs plan and optimize share buyback programs to improve EPS, P/E ratio, and share performance. Why rigorous investment research? Read High-frequency Trading Models by a world-renowned publisher that summarizes the FinTech graduate teaching of a top university (JHU). For institutional investors, email pnn@yeswici.com to request PNN charts for investment success. © 2017 Yeswici LLC. ALL RIGHTS RESERVED. © PNN® PATENTED.